Do I need Review Insurance? Let’s face it, your online reputation is everything. Unfortunately, your company’s reputation can be destroyed in an instant with a single negative review or post. Most businesses have no idea what to do when this occurs. Many don’t even respond and just hope it goes away. Unfortunately, it does not go away and will continue to impact your business negatively. Today over 75% of all transactions start with online research. Therefore, it is critical to minimize all harmful listings and negative reviews that show up in search engine results as quickly as possible. The only way to win the trust and confidence of customers is by having a good reputation and delivering quality work. This is a crucial element in being regarded as a credible, trustworthy, reliable business. 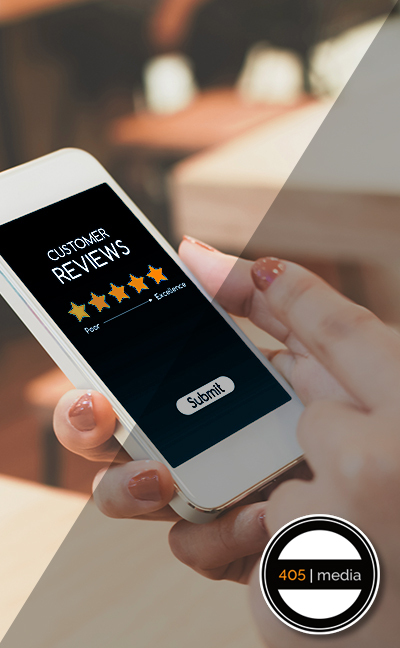 Let our Review Insurance team here at 405 Media Group help you restore your good reputation, suppress negative reviews, and wipe out negative footprints about your company. When people are actively searching for your product or service, you can’t afford to have negative inflammatory reviews of your company. When your potential customer needs you, it is critical to be shown in your best and most accurate light. By removing negative listings and populating search results with positive listings, you can provide that best image for your company. Clearly this impacts sales, referrals, and reduces unhappy customers. Review Insurance with 405 Media Group consists of creating positive keyword specific web properties for you. Then, we will design programs for you to cultivate reviews and have them posted online. We want the internet to be full of your happy customers and glowing reviews for your business! Additionally, our core service involves suppressing negative reviews. Some clients have unfair BBB reports, ripoff reports, or other negative forum reviews. By suppressing these and also providing corporate review insurance services that focus on brand positioning in your market, you will see a much more accurate positive reflection of your business.